This is not a normal RC car toy which functioned mainly by remote controller. Instead, this car makes all movement under your voice instructions! When you give out an order towards the watch-shape controller, the car will react perfectly following your command. Meanwhile , manual steering for turning left / right also available. 1. Voice control all operations via 8 different commands. For example , if you say " Go forward " towards the watch-shape controller , the car will move ahead accordingly because the watch-shape controller received the voice instructions from the player and automatically send out wireless signal to the car to make it run ahead. When you say " Demo " , the car will demonstrate its full functions under this command. This enable the car to speed up step by step. It gives more authentic experience to the kids. Under this frequency, it enables more Children to play together without interferring each other like 27Hz frequency remote toy. Also, it has better controlling distance ( around 12 - 20 meters ). 4. USB cable for power recharging. Both the car and the watch-shape remote controller coming with rechargable li-on battery. Simply plug the USB cable socket to USB port to recharge. When USB socket lights on, means under recharging. When USB socket lights off, means recharging completed. 5. 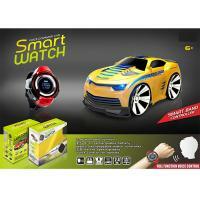 Super cool watch design remote control, with 2 manual buttons to steering RC car to turn left / right. 6. Transparent paint + UV paint on car surface, anti-scratching. Remote distance: approximately 12 to 20 meters.